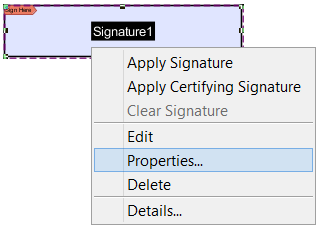 PDF Studio 9 and above is capable of creating Signature Fields. Signature Fields allow you to create fields that your users can use to digitally sign the PDF document. Once you have completed placing the Signature Field you can edit the Signature Fields’s specific settings to customize the field even further. To open the Signature FIeld’s settings menu either double click on the form or right click and select properties. Repeat steps 1-10 to create as many Signature Fields as you need.